Nuova BMW x3 2018 - Lightweight makes a not very careful eye will not seem to have changed a lot this new BMW X3. Instead, the third generation changes and does it in the right places. His style is now much more aggressive and robust. Compared to the previous version shows more rounded lines, with two clearly visible ribs on the bonnet, the characteristic BMW double kidney increased in height and width, hexagonal-shaped fog lamps, more similar projectors, for the first time in the X range , the classic style of sedans and a higher belt line in addition to the taillights from the new 3D design. Growing Measures The Bavarian average grows bigger and the X3 SUV grows in size. Nuova BMW x3 2018 - Now they are 4.71 meters long, a measure equal to that of the first generation of the BMW X5, gains a cm in width reaching 1.89 meters and loses one in height with its 1.66 meters. The pace grows by 5.4 cm all in favor of greater internal habitability. The aerodynamics of the car has been revised reaching the CX target of only 0.29 important result being an SUV. The height from the ground remains unchanged compared to the second generation as well as the capacity of the luggage compartment: 550 liters extendable, to the rear bench folded down (40:20:40), to 1600. Serial and Not The BMW X3 offers a lot of standards compared to the past. In fact, already it provides for the entry level fitting the four-wheel drive xDrive the automatic transmission Steptronic 8, 18-inch wheels, front and rear sensors, lights package and roof rails. The latest generation Driving Assistant systems and Active Cruise Control with Stop & Go cost respectively 920 euros and 1230 euros. Given the efficiency and exclusivity of these safety systems and driving assistance, the price, salty, is justifiable. 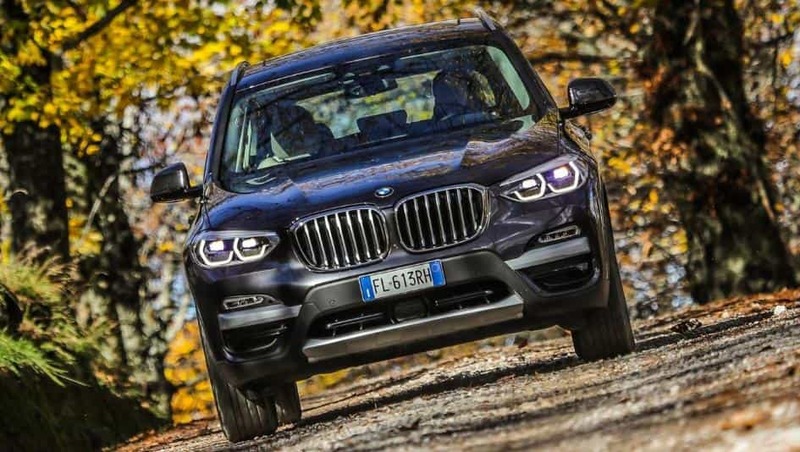 Nuova BMW x3 2018 - Little justifiable is the choice to charge separately the rear camera (570 euros), Apple CarPlay (310 euros), Bluetooth commands (360 euros) and paddle on the steering wheel (160 euros) given the attack price equal to almost 50,000 euros. Luxury Interiors a decisive step towards comfort and luxury. A great leap in quality compared to the past where the family feeling with the high-end sedans of the 5 Series and 7 Series is now very evident. From the quality of the materials used for saddlery and inserts to the hexagonal design for the climate and radio moldings. The central tunnel is quite wide and houses the gear lever, the wheel to manage the infotainment and the 3 buttons to change the dynamic configuration of the car. The dashboard is completely digital and the very thin central screen "floats" above the wooden insert of the dashboard. The soundproofing of the passenger compartment reaches the state of the art thanks to the windscreen and side-glass assembly with a noise-absorbing glass studied ad hoc. All very comfortable and elegant. Almost Autonomous Guide We cannot yet speak autonomously only for bureaucratic matters. There is still no legislation but the new BMW 7 Series, 5 Series, 5 Series Touring and the new X3 are really ready. We can experience all the BMW technology on the road and rely completely on the guidance that the onboard technology offers us. Radar and cameras, disseminated in the car, dialogue giving us a much more relaxing driving experience because the car steers and brakes to stop and then leave promptly. All this completely autonomously provided you keep two hands steady on the steering wheel. The ' Active Cruise Control with function Stop & Goit is really the solution to city traffic stress with a special focus on safety thanks to anti-collision systems with pedestrian recognition. Nuova BMW x3 2018 - Range Engines and Prices The offer engines for the new SUV from BMW expands with it unique for X3. It is called xDrive M40i and is the first "M" sprint version since the birth of X3 in 2003. This real monster is equipped with a 3.0 liter 6 cylinder turbo-benzine 360 hp. The entry level is represented by the 2.0 liter petrol 184 hp xDrive 20i, while the version most requested by our market will be the 20d turbodiesel 190 hp. The 30d turbodiesel is declined in two powers: 249 and 265 hp. The price is between 49.900 euros for the xDrive 20i and 71.800 euros of the drive M40i.